My father recently read about a Cabernet Sauvignon Shiraz Blend from Withington Wines, a wine estate in the Darling region. He asked me to please taste the wine as he was interested in purchasing some. I contacted Withington Wines to find out where the wine was sold locally but they don’t have a sales outlet anywhere near to us. So, as I had to order 12 wines to get them delivered to me, I decided to hold an informal wine tasting. I chose 3 red wines to taste – the Cabernet Sauvignon Shiraz, the Carignan, and a Pinotage. The wines were paid for and delivered and the guests were invited. I decided that an informal group made up of Norman McFarlane, his wife Eppie, Erica Liebenberg and Dave and I would be a good mix. As we were doing the wine tasting after lunch I only did cheese platter and meat platters to accompany our tasting. On the Saturday morning of the tasting, Dave worked on the house while I got things ready and about 2 hours before our guests were due I opened the box. The first bottle of wine that I took out was cold – and the label was wet, and it turned out that instead of the Cabernet Sauvignon Shiraz blend, I had been sent some Chardonnay, which must have been put into the box chilled. I called and spoke to Charles Withington who was devastated for me! His wife drove from Darling to meet Dave at the airport – an hour’s drive each way for both of them. She swapped the 4 incorrect wines for a case of the Cabernet Sauvignon Shiraz, and Dave got home with minutes to spare before the guests arrived. The end result of our tasting is that my Dad ordered 20 cases of the Cabernet Sauvignon Shiraz Blend wine! Disclosure: I was given wine at no charge. I have not been compensated for this post and neither was I asked to write a positive review. This is in line with my blogging policy. This was a lovely tasting, thoroughly enjoyed by all involved! Thanks Tandy for setting it all up and well done for blogging with your characteristic quality! what a beautiful wine tasting night! You are always very careful to organize perfect tables for your guests…the wine notes are very interesting. What a fun idea. I think I might need to take a wine class or something before doing this. However I am all about the munchies to go with the wine tasting. A very interesting post! I don’t know much about wines but they all sound good. I love wine tasting! Sounds like your dad picked up on a ton of flavor in these! Good thing you were able to get the correct wine in time for your tasting Tandy but what a bother! I love that you did a wine tasting – such a great idea. I really love Pinotage — it is such a unique wine and one that it only made in South Africa I believe. Your review of the Withington sounds lovely. 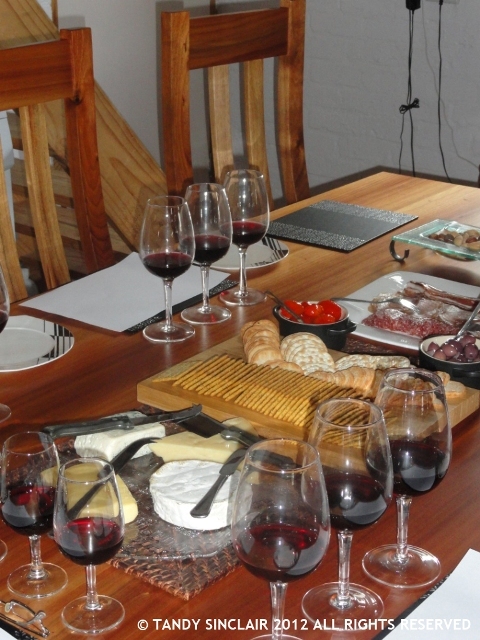 Great idea to have a wine tasting with munchies with friends! I love wine tastings and I am not surprised the Carignan was elected your favourite! I am wondering now what your father ordered?